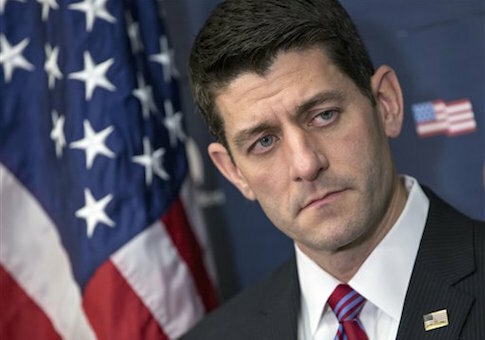 House Speaker Paul Ryan (R., Wis.) told House Republicans on a conference call Monday morning that he will no longer defend Donald Trump and instead focus on retaining his party’s majority in the chamber. "The speaker is going to spend the next month focused entirely on protecting our congressional majorities," a Ryan spokeswoman said in a statement. Ryan reportedly met with advisers ahead of the call to discuss whether he should withdraw his support for the Republican presidential nominee following the release Friday of a 2005 video showing Trump making lewd and derogatory remarks about women. Over the weekend, Ryan revoked his invitation for Trump to join a campaign event in Wisconsin. Ryan has expressed increasing alarm over the direction of Trump’s campaign both publicly and privately. Sources told Politico on Sunday the Wisconsin Republican had yet to make an official decision regarding his endorsement. "I think they all face the same dilemma to varying degrees," a senior House Republican leadership aide told Politico, referring to GOP congressional members. "How to express displeasure in a meaningful way … How best to help members in tough races … How to try to rebuild the party post the anticipated apocalypse. I think they are all having individual and group discussions wrestling with this." Dozens of Republican lawmakers, including Sens. John McCain of Arizona and Kelly Ayotte of New Hampshire, withdrew their support for Trump last week, with some calling for the GOP nominee to drop out of the presidential race. Trump told the Wall Street Journal on Saturday there is "zero chance" he would quit the election despite fallout from the tape. This entry was posted in Politics and tagged 2016 Election, Donald Trump, Hillary Clinton, House of Representatives, John McCain, Kelly Ayotte, Paul Ryan. Bookmark the permalink.